98 min. Walt Disney Studios Distribution. Directors: Ron Clements, John Musker. Cast: Keith Anthony, Kwesi Boakye, Roger Aaron Brown, June Christopher, David Cowgill. The more things change, the more they stay the same. Plenty of change arises in Disney’s musical The Princess and the Frog: people turning into frogs, love transforming two into one, and the studio returning from CGI to 2D animation after a five-year hiatus. But all the change feels awfully familiar, by (backwards) design, making The Princess and the Frog cinematic comfort food, if not great art. But don’t trust the fellow advertising “Dreams Made Real.” Voodoo sorcerer Dr. Facilier (the ever-distinctive Keith David), a.k.a. “The Shadow Man,” expertly manipulates the emotional needs of Prince Naveen and his mutton-chopped, roly-poly valet Lawrence (Peter Bartlett). Chaos ensues, with Naveen turned into a frog and his valet determined to steal his princely life. When Naveen begs a kiss from Tiana, it’s not he who becomes human, but she who becomes a frog, forcing the pair to seek refuge in the bayou. After meeting aspiring jazz trumpeter Louis (Michael-Leon Wooley)--inconveniently an alligator--and heartsick Cajun firefly Ray (Jim Cummings), the new friends go off to see the wizard--err, that is, 179-year-old blind voodoo priestess Mama Odie (Jenifer Lewis). From its “wish upon a star” opening (“There’s magic in the air tonight, and anything can happen”) to its Mardi Gras climax, the beautifully hand-drawn The Princess and the Frog keeps up a brisk pace and energy, but only partly achieves the effervescence of a Disney “classic.” Directors John Musker & Ron Clements (The Little Mermaid, Aladdin) cleverly allude to the entire history of Disney 2D animation, in thoughtfully skewed angles on plot and character formulas and in stylish retro nuances both visual and aural (the bass chorus behind Facilier in the punchy “Friends on the Other Side”). Randy Newman’s songs also serve the story well, particularly Tiana’s announcement of spirit (“Almost There”) and Mama Odie’s show-stopping “Dig a Little Deeper.” If only the story had sidelined the prince and princess and been the epic battle of the evil Shadow Man ("The real power in this world ain't magic; it's money!") and Mama Odie ("Money ain't got no soul;/Money ain't got no heart"), we'd really have something. 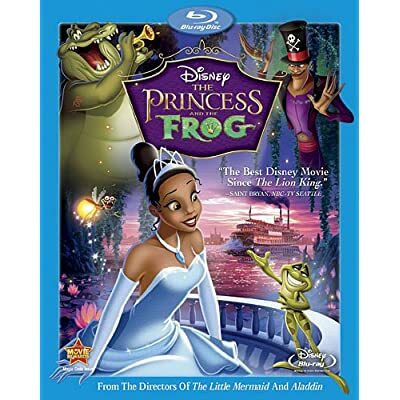 Where The Princess and the Frog stumbles a bit is in its wan wit (despite strenuous efforts, this isn’t a particularly funny movie) and its sometimes confused insistence on having it all in every regard of plot and theme (e.g. hard work is a core value, but don’t be a workaholic, but still achieve your dreams, but don’t neglect your family…). For its apparent feminist, anti-“lookism” leanings, the story still ends with--well, I’ll let you find out for yourself...or take a guess. The A/V for the Blu-ray presentation of The Princess and the Frog is pure perfection. Disney has lavished attention on this return to hand-drawn animation, using digital technology to capture everything seen and heard in theaters with crystal clarity. The image is boldly colorful, sharply detailed, deep and rich in shadows, and all-around vibrant, while the DTS-HD Master Audio 5.1 surround mix is robust and rambunctious in its delivery of the film's many musical sequences and slapstick sounds. The bonus features include an audio commentary with co-writers/directors John Musker & Ron Clement, and producer Peter Del Vecho, four "Deleted Scenes" (11:43, HD) introduced by Musker & Clement, and the "'Never Knew I Needed' Music Video by Ne-Yo" (4:04, HD). Musker & Clement make great, friendly hosts: clearly knowledgable, they just as clearly love practicing their craft and celebrating the Disney legacy. Two "Bringing Life to Animation" segments (8:08, HD) also come with an intro by Musker & Clement, as they explain the use of live-action reference footage. We see that footage in split screen with animation footage, overlaid with commentary by Musker & Clement. The two featured scenes are "Dig a Little Deeper" and "The Proposal." The enjoyable making-of featurette "Magic in the Bayou: The Making of a Princess" (22:11, HD) features behind-the-scenes footage and interveiws with Musker, Clement, executive producer John Lasseter, Del Vecho, "Dr. Facilier" supervising animator Bruce Smith, "Prince Naveen" supervising animator Randy Haycock, effects animation supervisor Marlon West, "Lawrence" supervising animator Anthony DeRosa, story supervisor Don Hall, art director Mike Gabriel, "Tiana" supervising animator Mark Henn, writer Rob Edwards, Anika Noni Rose, Jenifer Lewis, Terrence Howard, art director Ian Gooding, composer Randy Newman, choreographer Betsy Baytos, and "Mama Odie" supervising animator Andreas Deja. Rounding out the disc are several short promotional featurettes covering various behind-the-scenes subjects. "The Return to Hand-Drawn Animation" (2:43, HD) features interviews with Clement & Musker, Deja, Smith, animator Mike Surrey, and Lasseter; "The Disney Legacy" (2:31, HD) includes Smith, Deja, animator Eric Goldberg, Henn, and Clement & Musker; "Disney's Newest Princess" (2:51, HD) rounds up Clement & Musker, Henn, Rose, Howard, Del Vecho, Edwards, Lasseter and Lewis; "The Princess and the Animator" (2:26, HD) features Henn and Clement & Musker; "Capturing the Villain" (1:50, HD) gathers comments from Smith, Keith David, and Clement & Musker; and "A Return to the Animated Musical" (3:13, HD) includes Clement & Musker, Edwards, Lasseter, Del Vecho, Newman, Lewis, Jim Cummings, Rose and Bruno Campos. Also included are Art Galleries in the areas of Visual Development, Character Designs, Layouts & Backgrounds, and Storyboard Art, as well as the kid-friendly game What Do You See: Princess Portraits. All in all, it's a delightful home-video package, available in single-disc and Blu-ray + DVD + Digital Copy combo pack editions. All site content © 2000-2019 Peter Canavese. Page generated at 04/25/2019 08:57:58PM.